Walking down Thomas street and loving the names of the shops ; ‘Watercolours’ ‘Bella Italia’ ‘Medjana’ the names roll off the tongue. I see the brightness of the street. Its wideness makes me look left and right as I try to catch it all. People strolling, children skipping. I hear snippets of chat (‘Fair play Walter!’ ‘Did you get that dress?’ ‘Johnny, don’t run’, ‘Will you be much longer’ ‘Did you like your food Madam?’ as I pass the outdoor cafes. Laughter pulses up with the smoke from the cigarette, twirls in the air and gone and the space taken with the next sentence. More laughter. 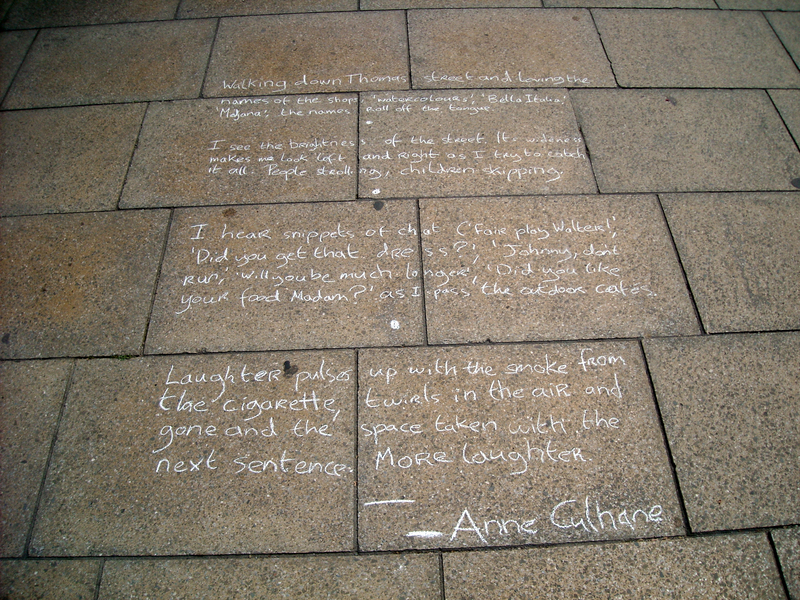 This entry was posted in Uncategorized and tagged Anne Culhane, Chalk, Critics, Limerick, place, poetry, Socially Engaged Art, street, Thomas Street, Writing Exercises. Bookmark the permalink.